Client: Colonial League of Interscholastic Sports, Inc. In spring 2012, Kernie Cam Productions and 4O1! Creative teamed up to redesign and reprogram the website for the Colonial League of Interscholastic Sports, an organization comprising the athletic programs of 14 eastern-Pennsylvania high schools. Splitting the responsibilities, Kernie Cam handled the overall aesthetic appearance of the site while 4O1! assembled their experienced squad of web programmers to make our design functional. 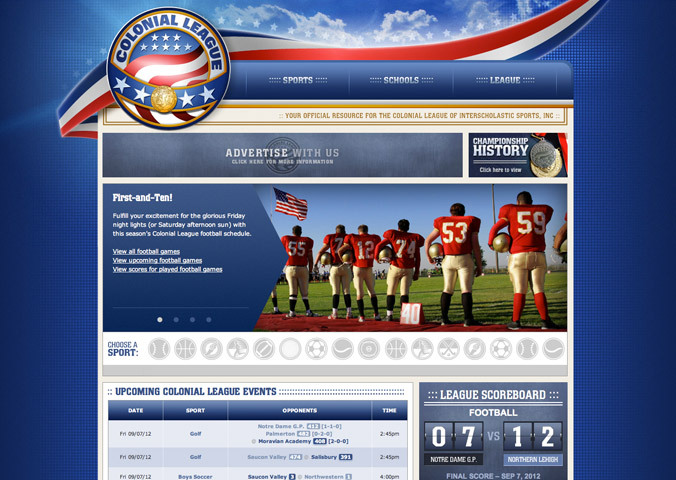 Complete with dynamic sports schedules, automatically generated standings, school profiles, and detailed league information, the new Colonial League website was launched on August 31, 2012 and was quickly applauded for its attractive design, user-friendly interface, and robust site content. The site was designed by Kernie Cam Productions using Adobe CS5 Photoshop and Illustrator software. The site was largely programmed by 4O1! Creative using HTML, PHP, and CSS coding languages within the WordPress content management system.